Use Magic Key Tool to dump / backup NDS ROMS from DS game cards. 1. Flash MAGICKEY Tools V1.0.nds.gba onto a NEO 512M flash card. 2. Put Original NDS game into neo Magic Key,then insert the Magic Key into NDS slot. 3. 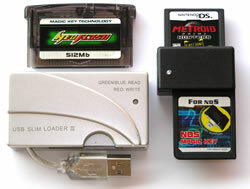 Insert the NEO 512M flash card into Nintendo DS GBA slot. 5. The MAGICKEY app will load and read from NDS game and save to NEO Flash card. and save type, for example "256M , EEPROM , 64K". again when the dump near finish. 9. Sselect the dumped title, click the "Save Selected", then...just wait, you will get the final RAW file in "c:\dir 1". This does not include a loader for you to be able to use the dumps, it's only a tool to dump so you are NOT able to play the backuped game right after it was dumped. c. Then "Ctrl+D",select "Delete",fill in "999999999",enter. d. You have a real RAW dump now. You can modify the RAW file name,and add the save type and save size to the end,like "DEMO GAME - EEPROM 64K.nds" . This has only been tested with 64M / 128M / 256M Nintendo DS carts. It has not been tested with 512M game carts since we dont have any.